Since Barack Obama visited Havana in March 2016—the first U.S. president to travel to the island nation since 1928— and took steps to normalize U.S.-Cuba relations, tourism to the island has exploded. As my own spring break approached this past March, I decided to take a couple of my students from Fordham Law School to this Caribbean destination to explore the impact of Obama-era policies on Cubans. With the support of the Law School’s Leitner Center for International Law and Justice, we boarded a flight that took off just before a blizzard of snow blanketed New York City. Amidst the tropical weather, we were surprised by the throngs of American tourists flooding the streets, but even more so by what we learned about the opportunities and challenges facing Cuban women. Despite the strides women have made in both education and employment in Cuba, where they comprise nearly half the labor force, women are still underrepresented in traditionally male sectors and face glass ceilings in certain leadership positions. Among other barriers, while paid maternity and paternity leave are guaranteed by the government up to a point, women are more likely than men to take parental leave and the paid leave available for men is inadequate. Cuban women also lack access to quality, affordable childcare following their maternity leave, when they are otherwise ready to return to work. The work that women disproportionately undertake to care for their own children is largely unwaged work—following an initial period of paid maternity leave—and outsourcing this care is prohibitively expensive for many Cuban women. Many relationships in Cuba are also transient, and women often end up single parenting. Cubans are simply not marrying at the same rate as couples in other parts of Latin America and the Caribbean. Some observers attribute Yoruba religious values that do not stress marriage the way Catholicism does, but other constraints likely play a role. Cuba faces a huge housing crisis, with few new homes built there in 50 years and existing homes falling apart. The housing shortage makes it difficult for new families to start on their own. Cuban women can take 18 weeks of maternity leave with one hundred percent of their pay—six weeks before birth and 12 weeks after—with the option of taking an additional 40 weeks at 60 percent of pay. While fathers do not receive paternity leave for the first 18 weeks, they can take 40 weeks of paternity leave at 60 percent pay beginning anytime between weeks 12 and 40. In total, the policy allows for up to 52 weeks of leave—or until the child’s first birthday—for mothers. Cuba’s policy, in some respects, puts it in league with other countries with generous paid maternity leave policies, available in only a small number of countries. By guaranteeing 18 weeks of fully paid maternity leave, Cuban mothers are on par with mothers in Denmark, Lithuania and Sweden. But while the offer of long-term maternity leave at 60 percent of pay is generous in contrast to many other countries, many Cuban men and women find they cannot afford the 40 percent pay cut due to the nation’s economic standing—and while fathers have the ability to take paternal leave, not many take it. One report notes that only 125 fathers requested paternal leave between 2006 and 2013 out of a population of close to 11 million Cubans—and around 5 million men. A disincentive is the fact that men do not receive full pay for parental leave the way women do in the weeks immediately preceding and following pregnancy. Many observers note that men are less likely to take parental leave because of a culture of machismo—a strong sense of masculine pride—which, as is the case in many other countries, discourages men from taking leave to care for children as childcare is generally associated with women and femininity. In addition, although women in Cuba are able to enroll their children in government-run day care centers once their toddlers can walk—generally between nine to 18 months—the government-run day care system is unable to keep up with demand. In light of this, there is an alternate system of private day care centers, which are often more expensive than public day care. For women whose children are not in government day care and who cannot afford private care, the lack of childcare is a significant barrier to returning full-time to work. Cuba lost its largest benefactor when the Soviet Union collapsed in 1991, and in the decades since the nation has struggled to find foreign investment. While a growing tourism sector—including now from the United States—has helped economically, the U.S. trade embargo cuts off imports and exports with an enormous market that is only 90 miles away. The Cuban government has undertaken reforms to allow for an increasing amount of self-employment and private sector activity—including a booming market of Airbnb rentals for tourists—but the private sector is limited, tightly regulated and heavily taxed. Moreover, despite having one of the highest literacy rates in the world, Cuba has a surprisingly low standard of living. In 2015, Cubans on average made around 687 pesos, or around 20 to 25 U.S. dollars per month. 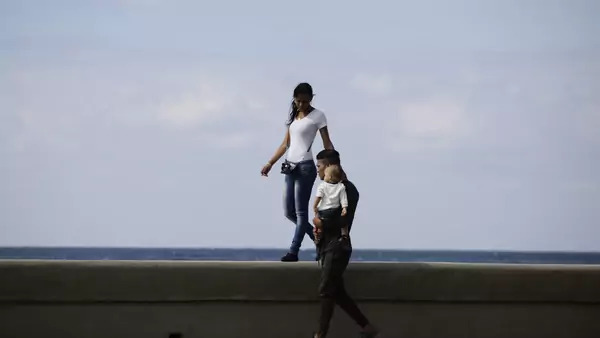 As one Cuban woman noted, having a baby in Cuba “can be economically a tremendously stressful challenge.” Many ordinary Cubans simply cannot afford to have children, and many Cuban women are reluctant to. Many who do will not return to work. This may help explain why Cuba has the lowest birth rate in Latin America—one below the replacement level of one daughter per woman. If Cuba is able to address barriers women face in the labor force, Cuban women, Cuban families and the Cuban economy as a whole will benefit. This post has been cross-posted at Ms Blog. The President’s Immigration Executive Order: What’s Gender Got to Do With It?